Established in 1981, Solapak Limited continues to be a leader in the renewable energy field and an expert in engineering and supply of complete, ready to install, Solar Power Systems for industrial off-grid applications. Solapak Limited had its first footsteps in Buckinghamshire, England, and, over the years, continued to grow as one of “the best in class” stand-alone, industrial type, PV solar power system solutions provider for both, safe and hazardous (ATEX certified) area systems. With its far-reaching and countless successful projects executed around the Middle East, Europe, Asia and North Africa, Solapak Limited is particularly proud to have established another fully fledged engineering and design branch in the Middle East in 2013, located in Masdar City, Abu Dhabi, enabling us to have a stronger presence in the region and a closer reach to our international clients. Solapak Limited is a specialized engineering company that focuses on the art of using Photovoltaic (PV) technology to harness electricity generated from sunlight and designing complete system solutions to create stand-alone Solar Power Systems that fulfill the ambitious energy requirements of our clients. Solapak Limited prides itself in being approved with almost all of the major Oil and Gas companies globally and having the expertise to design Solar Power Systems in line with the highest industry specifications and guidelines including the Shell Design and Engineering Practices (DEP), as well as the IEC, BS and TUV standards relevant to our industry. Our systems are far from being another simple shelf product. Our systems are designed with a life-long support that satisfies and exceeds our customers’ expectations. A dependable energy source aimed to continuously serve every user for as long as they desire. Our systems are engineered to fit your exact needs! Solapak aims to continue its growth as one of “the best in class” stand-alone, industrial type, PV solar power system solutions and related support services. We strive on high technical and professional delivery while developing strong relationships with clients, local industry partners and regional agents. Solapak’s aspires to provide state of the art, innovative and reliable Solar Power Systems’ solutions and supporting services. Our systems are assembled using customized parts from the world’s leaders components manufacturers, adhering to the Shell Design and top industry standards related to Solar Power Systems. 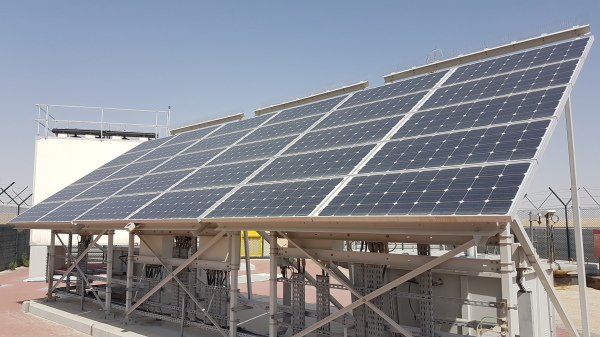 Solapak strives as a leader in the renewable energy field, specializing in customizing, engineering and supply of complete ready to install Solar Power Systems for off-grid application to fit your exact industrial needs. Solapak history goes back several decades. It has always been a pioneer in the photovoltaic off-grid industry. To our clients, I say thank you for your business and your confidence in us. To our suppliers, I wish to say that without your support our mission would be difficult to fulfill. I count on the support of all our stakeholders and you can count on us. We engineer, design and build our systems based on reliable British technology and European products. We have in the last few years made a huge comeback and our plans are to continue to provide best in class service to all our clients. 2016 saw our largest and most ambitious projects and we stay with a confidence that 2017 will soar even higher.